The song Tarkeebein was featured in the 2010 Yash-Raj Films’ romedy Band Baja Baaraat (Wedding Planners) directed by Maneesh Sharma and produced by Aditya Chopra. The movie starred Ranveer Singh and Anushka Sharma in the lead. Aditya Chopra remade this movie in Tamil as Aaha Kalyanam (2014) under the Yash-Raj Films’ banner. The Telugu Jabardasth (2013) was not an official remake. The movie begins with this song and the titles are shown with it. Saleem-Suleiman and Amitabh Bhattacharya have been credited for the music and the lyrics, respectively. The cinematography is by Aseem Mishra. Dance choreography is by Vaibhavi Merchant. The video opens with the introduction of the Yash-Raj banner and the name of the movie. Then, the camera pans everyday locations and situations. Next, the location is a hostel where several young men are drying their clothes on clotheslines, tied in front of their rooms. A young man’s back is shown as he walks out from his room to the common balcony of the hostel/bachelor accommodation. It turns out that the young man is none other than Ranveer Singh. Elsewhere, Anushka Sharma is running to catch a bus and catches it. The song begins in the background with the lead pair going about their work at different locations. Both appear to be students and are involved in regular student activities. A man tries to jostle Anushka Sharma in a non-crowded road. She turns, threatens him and chases him away. I like that! The lead actors do not know each other in the movie at this point. Thus, though standing beside each other, they do not even bother about one another. The song and the video end by evening. Probably, the movie makers wanted to highlight a typical day in the lives of the lead pair through this song. There is a lot of activity all through the song with quick changing shots, depicting the hectic life of students. The playback of this song has been credited to Benny Dayal and Saleem Merchant. The onscreen performances are by Ranveer Singh and Anushka Sharma. 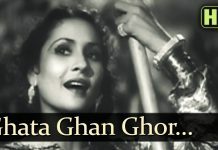 This typically filmi song introduces the lead artists. The song and the artists are ok. The video is watchable for the same.